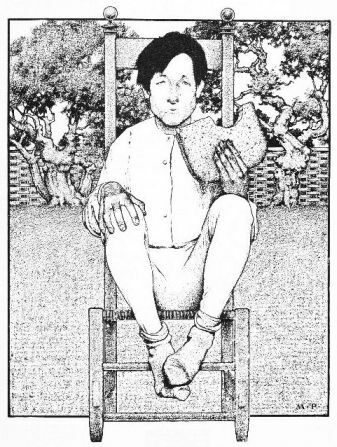 Published in L. Frank Baum's first children's book, Mother Goose in Prose (1897), illustrated by Maxfield Parrish. What did he sing for? white bread and butter. How could he cut it, without any knife? How could he marry, without any wife? Little Tommy Tucker was a waif of the streets. He never remembered having a father or mother or anyone to care for him, and so he learned to care for himself. He ate whatever he could get, and slept wherever night overtook him--in an old barrel, a cellar, or, when fortune favored him, he paid a penny for a cot in some rude lodging-house. His life about the streets taught him early how to earn a living by doing odd jobs, and he learned to be sharp in his speech and wise beyond his years. One morning Tommy crawled out from a box in which he had slept over night, and found that he was hungry. His last meal had consisted of a crust of bread, and he was a growing boy with an appetite. He had been unable to earn any money for several days, and this morning life looked very gloomy to him. He started out to seek for work or to beg a breakfast; but luck was against him, and he was unsuccessful. By noon he had grown more hungry than before, and stood before a bake-shop for a long time, looking wistfully at the good things behind the window-panes, and wishing with all his heart he had a ha'penny to buy a bun. And yet it was no new thing for Little Tommy Tucker to be hungry, and he never thought of despairing. He sat down upon a curb-stone, and thought what was best to be done. Then he remembered he had frequently begged a meal at one of the cottages that stood upon the outskirts of the city, and so he turned his steps in that direction. "I have had neither breakfast nor dinner," he said to himself, "and I must surely find a supper somewhere, or I shall not sleep much to-night. It is no fun to be hungry." So he walked on until he came to a dwelling-house where a goodly company sat upon a lawn and beneath a veranda. It was a pretty place, and was the home of a fat alderman who had been married that very day. "Come here, my lad, and sing us a song." Tommy at once entered the grounds, and came to where the fat alderman was sitting beside his blushing bride. "Can you sing?" enquired the alderman. "No," answered Tommy, earnestly, "but I can eat." "Ho, ho!" laughed the alderman, "that is a very ordinary accomplishment. Anyone can eat." "If it please you, sir, you are wrong," replied Tommy, "for I have been unable to eat all day." "And why is that?" asked the alderman. "Because I have had nothing to put to my mouth. But now that I have met so kind a gentleman, I am sure that I shall have a good supper." The alderman laughed again at this shrewd answer, and said, "you shall have supper, no doubt; but you must sing a song for the company first, and so earn your food." Tommy shook his head sadly. "I do not know any song, sir," he said. The alderman called a servant and whispered something in his ear. The servant hastened away, and soon returned bearing upon a tray a huge slice of white bread and butter. White bread was a rare treat in those days, as nearly all the people ate black bread baked from rye or barley flour. "Now," said the alderman, placing the tray beside him, "you shall have this slice of white bread and butter when you have sung us a song, and complied with one condition." "And what is that condition?" asked Tommy. "I will tell you when we have heard the song," replied the fat alderman, who had decided to have some amusement at the boy's expense. Tommy hesitated, but when he glanced at the white bread and butter his mouth watered in spite of himself, and he resolved to compose a song, since he did not know how to sing any other. That was wet with the rain of a morning shower. And he could n't fly again for half an hour! "Good!" cried the alderman, after the company had kindly applauded Tommy. "I can't say much for the air, nor yet for the words; but it was not so bad as it might have been. Give us another verse." It caught on a moon in a cloudy sky. Fell the web, and captured a big blue fly!" "Why, that is fine!" roared the fat alderman. "You improve as you go on, so give us another verse." "I don't know any more," said Tommy, "and I am very hungry." "One more verse," persisted the man, "and then you shall have the bread and butter upon the condition." And caught a cold in an awful fog. Till croaking he scared a polliwog!" "You are quite a poet," declared the alderman; "and now you shall have the white bread upon one condition." "What is it?" said Tommy, anxiously. "That you cut the slice into four parts." "But I have no knife!" remonstrated the boy. "But that is the condition," insisted the alderman. "If you want the bread you must cut it." "Surely you do not expect me to cut the bread without any knife!" said Tommy. "Why not?" asked the alderman, winking his eye at the company. "Because it cannot be done. How, let me ask you, sir, could you have married without any wife?" "Ha, ha, ha!" laughed the jolly alderman; and he was so pleased with Tommy's apt reply that he gave him the bread at once, and a knife to cut it with. "Thank you, sir," said Tommy; "now that I have the knife it is easy enough to cut the bread, and I shall now be as happy as you are with your beautiful wife." "How would you like to live with me and be my servant?" "I should like it very much, sir." So the alderman took Tommy for his servant, and dressed him in a smart livery; and soon the boy showed by his bright ways and obedience that he was worthy any kindness bestowed upon him. "I have long wanted to adopt a son, for I have no children of my own; but I have not yet been able to find a boy to suit me. That lad of yours looks bright and intelligent, and he seems a well-behaved boy into the bargain." "He is all that you say," returned the alderman, "and would be a credit to you should you adopt him." "But before I adopt a son," continued the mayor, "I intend to satisfy myself that he is both wise and shrewd enough to make good use of my money when I am gone. No fool will serve my purpose; therefore I shall test the boy's wit before I decide." "That is fair enough," answered the alderman; "but in what way will you test his wit?" "Bring him to my house to-morrow, and you shall see," said the mayor. So the next day the alderman, followed by Tommy and a little terrier dog that was a great pet of his master, went to the grand dwelling of the mayor. The mayor also had a little terrier dog, which was very fond of him and followed him wherever he went. "Tommy, I am going up the street, and the alderman is going in the opposite direction. I want you to keep our dogs from following us; but you must not do it by holding them." "Very well, sir," replied Tommy; and as the mayor started one way and the alderman the other, he took out his handkerchief and tied the tails of the two dogs together. Of course each dog started to follow its master; but as they were about the same size and strength, and each pulled in a different direction, the result was that they remained in one place, and could not move either one way or the other. "That was well done," said the mayor, coming I back again; "but tell me, can you put my cart before my horse and take me to ride?" "Certainly, sir," replied Tommy; and going to the mayor's stable he put the harness on the nag and then led him head-first into the shafts, instead of backing him into them, as is the usual way. After fastening the shafts to the horse, he mounted upon the animal's back, and away they started, pushing the cart before the horse. "That was easy," said Tommy. "If your honor will get into the cart I 'll take you to ride." But the mayor did not ride, although he was pleased at Tommy's readiness in solving a difficulty. "Let me see you drink up this cup of water." "The water is drunk up, your honor." "But why did you stand on your head to do it?" enquired the alderman, who had watched the act in astonishment. "Because otherwise I would have drunk the water down, and not up," replied Tommy. The mayor was now satisfied that Tommy was shrewd enough to do him honor, so he immediately took him to live in the great house as his adopted son, and he was educated by the best masters the city afforded. And Tommy Tucker became in after years not only a great, but a good man, and before he died was himself mayor of the city, and was known by the name of Sir Thomas Tucker. 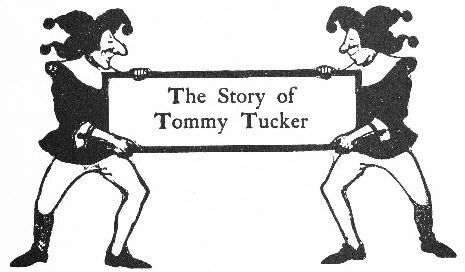 Add The Story Of Tommy Tucker to your own personal library.